From Group A, Mexico and Mexico 3rd division advanced. From Group B, Colombia and Spain went through to the knockout rounds. In group play, Mexico and Mexico 3rd division faced off but it was Mexico with a 4-0 victory. The underdogs would get a chance at redemption in the knockout stages. 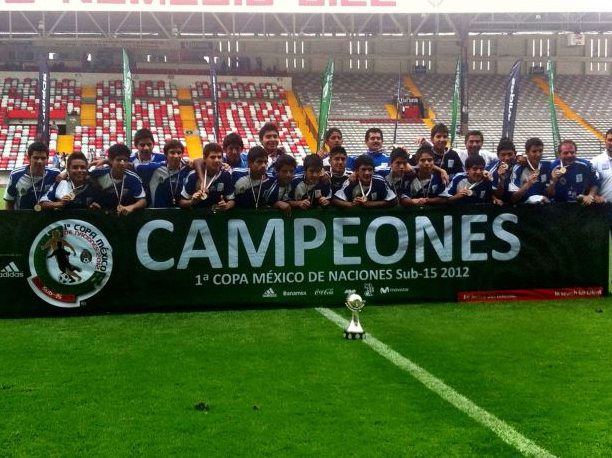 The game went into penalties as it was tied 2-2, and the Mexico 3rd division shocked Mexico winning on penalties 5-4. Colombia also went to penalties and were able to defeat Spain to setup a final with Mexico 3rd division. It was a close match all the way through, as Mexico 3rd division and Colombia needed extra time to find a winner. The score remained 2-2, as they headed to penalties. Mexico 3rd division pulled off the cinderella victory winning 6-5 in the penalty shootout. As a Mexico fan, it is hard not being excited for the youngsters. Not only that they won, but were the 3rd division back-ups for Mexico and were able to pull off the upsets! It has been a fun experience to see so many Mexican youth squads winning these tounrnaments. As we have seen since the 2005 U-17 World cup, Mexico appears to be making great progress! It was a “win or go home” scenario for Mexico in the semi-finals of CONCACAF Olympic qualifying. Canada came into the game as a dark horse after beating tournament favorites USA 2-0. Mexico seemed a bit shaky in the first ten minuets. Canada had some good opportunities, but luckily for Mexico nothing materialized. It was Alan Pulido early with a golden opportunity, but an awkward bounce caused Pulido to completely miss the ball. Though the momentum had been building for Mexico up to that point. In the 19th minute, Pulido received the ball, kicked back to Herrera who gave a beautiful go ahead pass to Marco Fabian. With ease, Fabian made it 1-0. Canada was able to send in a header for the equalizer…but just 45 seconds later Pulido put Mexico back on top. Mexico would dominate possession and sealed the victory with a final of 3-1. Coming into the game I made some keys to victory: 1) No major changes needed on defense 2) Avoid the stale possession 3) Fabian will be the go to player. All three were met, and Mexico soared throughout the game against Canada. I did say Canada would be a tough team to read, and although Mexico played stellar, Canada should not hang their heads. Mexico came out with aggression, and confidence and in football that is a major aspect for winning teams. Mexico now has a match-up with Honduras (again). Though the final should be somewhat like the Panama game, because both sides are clear for London 2012. Great tournament for Mexico so far…let’s see if they can capitalize this summer. Viva Mexico! Now I admit the title seems a bit off, because Mexico is only in the semi-finals of CONCACAF Olympic qualifying. However, they just need one more win to qualify. The semi-final game will be against Canada, who has shown some major ups and downs in the tournament. Canada tied El Salvador in game one, but shocked the United States with a 2-0 victory. The following game (although not a must win), Canada played Cuba to a 1-1 tie. It is a bit hard to predict how much fire power Canada will have against Mexico, but if one thing is for sure Mexico cannot take this game lightly. During group play, the only team to score against Mexico was Trinidad and Tobago, and it was late in the match. The biggest offensive threat Mexico had was Honduras, and kept them completely off the board. Jimenez, Ponce, Mier, and Reyes have been doing a great job in back. Canada has shown that they can counter so they will need to be prepared. Yet, if they play a solid game against Canada, as they did against Honduras, Mexico should walk away with a victory. The only game that Mexico didn’t need to win, they only put one goal in the net. The major problems against Panama were due to a lot of passes that lead to nothing promising. At times Mexico passed back to the defense for what felt like minuets at a time, which also never really threatened Panama. Being cautious is always good, but if you never get shots off…you cannot score. When Mexico played its best, the slow passing and resorting to the defense was minimal. Fabian is by far the leader on this U-23 squad. He has great dribbling skill and vision. Mexico will need Marco to guide the offense in the attack. He will have a good cast around him in Aquino, Cortes, and Pulido. He can create a lot of chances, and install a spark that will get Mexico its best opportunities at scoring. If he comes out confident like in the group stages, Mexico could be punching their ticket to the Olympics. Overall this should be a good game for Mexico. Canada is a bit of a difficult team to read, but we know they can cause problems. As long as ‘El tri’ comes out as they did in the first two matches, Canada could have a hard time gaining possession. Mexico will be facing Canada this Saturday, March 31st at 9:00 p.m. Eastern time. One more win and Mexico will be one of two teams representing the CONCACAF in London. Vamos Mexico! Erick 'Cubo' Torres celebrates his injury time goal against Panama(Mexsport). With a last minute goal from Erick ‘Cubo’ Torres against Panama, Mexico maintained their perfect record in the group stage of olympic qualifying. Mexico will face Canada on Saturday in the semifinals of the CONCACAF tournament to determine who gets a ticket to the London 2012 Olympics.